You may have heard about various recipes for homemade flea shampoo, made from common household staples. In this article, I will address whether these concoctions can be effective against fighting fleas. You will also find out how to make homemade flea shampoo for your pet. Finally, I will cover the potential risks of using homemade preparations on your pet. Can Homemade Flea Shampoo Be Effective? The effectiveness of any flea treatment, natural or chemical, depends on the ingredients. There are quite a few different recipes for flea shampoo available online. I have chosen to review the top three, frequently suggested ingredients in homemade flea shampoos. These include dish soap, essential oils, and vinegar. The most commonly recommended dish soap is Dawn. This detergent is touted to help drown and intoxicate fleas on your pet. Soap contains surfactants, which help to lower the surface tension of water. Water’s high surface tension enables insects, like fleas, to walk on the surface of water. Thanks to surfactants found in dish soap, fleas are more likely to sink in soapy water. Although fleas can survive submerged in water for up to 24 hours, sudsy water tips the odds in our favor. The foam can block a flea’s spiracles, which are respiratory openings throughout the flea’s body. Without open spiracles, a flea cannot breathe. Detergents like Dawn can be toxic to fleas as they degrade the waxes on the exterior of the flea’s body. Without this layer of wax, a flea is likely to die through dehydration. Essential oils can be active against insects by either repelling or killing them. The oils derived from certain herbs and plants can have insecticidal abilities. Oil from Alaskan yellow cedar trees can help to deter fleas. Myrtle and thyme oil have been shown to have strong repellent activities against pulex irritans. This is a species of flea that often targets domestic animals and can attack humans as well. A study on cinnamon oil revealed it was a capable repellent against the common cat flea. Mexican mint oil demonstrated the same beneficial repellency properties. It has been established that other oils do have insecticidal abilities. For example, tea tree oil can repel flies from livestock. Still, there is little evidence that other essential oils, aside from the ones I have mentioned, are effective against fleas. Apple cider vinegar and white vinegar are often endorsed as natural flea repellents. Unfortunately, there is no research available as to whether vinegar can repel fleas. Most flea shampoo recipes require that you dilute the ingredients (e.g. dish soap or vinegar) with water prior to application. This is especially important when it comes to shampoos that call for essential oils as the main ingredient. Keep in mind that essential oils are generally not intended for use on pets unless otherwise specified. These oils can be toxic, particularly to cats, if misused. I have refrained from recommending an essential oil-based shampoo for this reason. Instead, I will suggest a simple recipe for a homemade shampoo - employing dish soap and vinegar as the active ingredients. Dish soap does have some beneficial activities against fleas. Vinegar has yet to be proven as a solution against fleas, but it is not generally harmful to animals unless ingested. Mix one cup of your vinegar of choice with one cup of dish soap. Add one quart of water and thoroughly mix. Your shampoo is now ready to use. If you have a sensitive or young animal, you can dilute the mixture further. Use one-quarter of a cup of vinegar and dish soap each, rather than a full cup. As with the original recipe, mix thoroughly and prepare to bathe your pet. Apply the shampoo liberally to your dog or cat from head to tail. Avoid your pet’s eyes, mouth, and nose. Leave the mixture on for up to five minutes. Use a flea comb during this period to remove adult fleas and flea feces from the fur. Deposit the fleas in a bucket of soapy water away from your pet. Thoroughly rinse the shampoo off your companion with warm water once you are finished. If you notice any adverse or allergic reactions (e.g. skin irritation) from your pet, wash the shampoo off immediately. Take your cat or dog to an emergency veterinary care facility. Keep in mind that an ingredient which is non-toxic to humans might still be harmful to your pet, so use caution - especially when handling essential oils. Vinegar can cause diarrhea and vomiting if ingested by your pet. As it is an acidic substance, vinegar may also result in irritation to your pet’s skin. 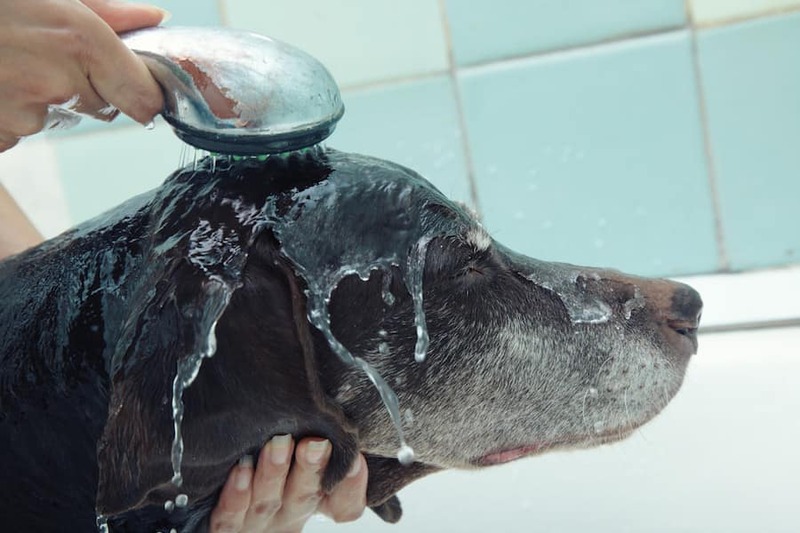 Using dish soap as a regular shampoo for your pet might not be the best solution either. When it comes to dogs, they have a different skin pH from humans. Their skin tends to be more alkaline than ours. This means that even if dish soap is formulated as safe for our skin pH, it might not be suitable for our canine companions. Regular use of such a product could provoke skin dryness and irritation. Dish soap can be a useful tool in fighting fleas - just not applied repeatedly as a pet shampoo. When using a flea comb on your pet, you can keep a bucket of soapy water on hand to dip the comb into. Once you are finished combing, rinse your companion’s fur with water until clean. Finally, I would like to impart one last word of warning. If your pet is infested with fleas, your home and yard are most likely infested as well. Only adult fleas live on the host. However, fleas at the earlier stages of development (eggs, larvae, and pupae) can survive without blood meals until they reach adulthood. With that said, you should always tackle the entire infestation as a whole. Treat your entire property at the same time as you treat your pet, or call a pest control specialist. Homemade flea shampoos may seem like an easier and cheaper alternative to treat your pet for fleas. And it could be that some of the advocated ingredients in these homemade shampoos may be effective against fleas. However, these recipes are not regulated and certain ingredients can be toxic to your pet if used incorrectly. For this reason, it is always preferable to consult your veterinarian to check if a homemade flea shampoo is appropriate for your pet.